New signing Zak Hardaker is hoping to quickly win over Castleford Tigers supporters who previously saw him as the enemy after his background in playing for Leeds Rhinos and Featherstone Rovers. 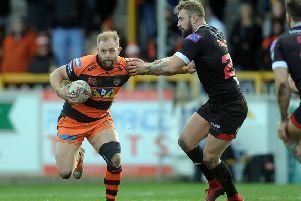 The 25-year-old Pontefract-born player is delighted to be making his debut in the Boxing Day game against Hull at the Mend-A-Hose Jungle and hoping for a good reception from Tigers fans now on the same side as him. He said: “Hopefully the fans will give me a cheer for my debut. “You get some good and some bad and that’s life, I’ve learned that the hard way. But the best way to show the fans and other people is to get out there and play so I’m really looking forward to Boxing Day against a really good Hull team. It should be good. “The fans have not been too bad on social media, I was expecting a lot worse so I’ve been happy about that. “I was asked what should Cas fans expect from me and it’s 110 per cent commitment. I can only do that on the pitch so first day will be Boxing Day. “I’m massively looking forward to making my debut for Castleford. Hardaker believes he has joined Castleford at a good time. He added: “There’s a really good buzz about the place.